Make this your go-to gift: 12 luscious Godiva truffles. 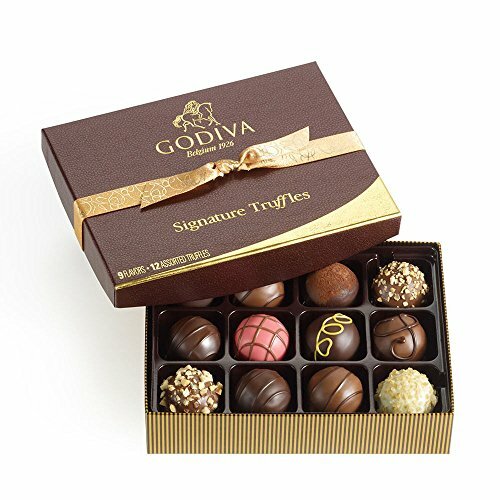 The assortment represents the full depth and breadth of Godiva’s world-famous truffle line with a delicious mix of sweet, savory, and spicy truffle flavors. Flavors include: Salted Almond, Aztec Spice, Salted Caramel, Dark Chocolate Truffle, Milk Chocolate Mousse Truffle, Hazelnut Crunch, Milk Chocolate Truffle, Creme Brulee Truffle, and Strawberry Creme Tarte Truffle. The elegant gift box is tied with a beautiful gold ribbon.Enjoy sweet, savory, and spicy truffle flavors from Godiva’s world-famous truffle line. Makes a decadent fancy chocolate gift.